Learn To Use Base Ten Blocks at Crewton Ramone's House of Math. 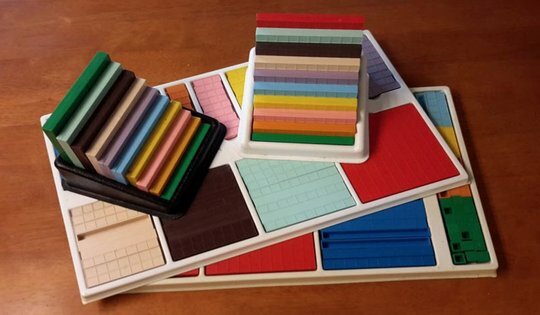 Learn To Use Base Ten Blocks To Make Math EZ! one day only April 24! Note how old this video is. This isn't something new, but it is something most people haven't discovered yet even if they already have base ten blocks, what I found out is that most people don't know how to use them effectively. For a FREE one hour overview of the system go here! People always ask where do I start? How about you start with that video and then click the getting started tab...? And you can quite literally start anywhere because this method is not what you are used to; math is counting so you could start with Algebra or division if you wanted to...it all teaches math. Update July 2018. Passwords have changed. Prices have gone up. The contact (us) page has my PayPal link. You can find a downloadable Price List on the products page. More training and PDFS have been added, four hours of math camp & nine hours of the winter training. Plus there's now a Superduper Supersecret Math Page on Facebook... And a whole lot more! There are now four modules that you can buy which each cost. $111.00...Or $399.99 all at once. That's like hiring me for 10 hours of tutoring. Except you literally get hundreds of hours of content. The content is just packaged a little differently, there is more of it and it should be much easier to navigate through. Click "password info" for more details. Use Your Base Ten Blocks! Want to see more free pages & lessons & other free stuff on this site? Consider a dollar a month. This will also allow me to volunteer my time. Note: Most Mortensen Product Ordering Buttons Have Been Removed Due To Shipping/Inventory Issues. Contact for ordering information and product availability. NEW! Passwords have been that re organized into modules. PASSWORD INFO ← Click to find out more. Already have Passwords but they don't work anymore? Hit the Contacts Tab and email me at gmail for the new ones. Passwords have changed as of 1January, 2019. The superduper supersecret math page on Facebook is NOT FREE. Just pay a one time entrance fee Of $27.50 for lifetime members, or $49.00 If you are "new." People are shockedand amazed when they see how much they get for a password. CC. 2008 - 2018 Crewton Ramone's House Of Math®. Some Rights reserved. You may copy any page, text or image from this site as long as you provide credit to this site and a live link to the original page. This does not apply to Password-Protected Pages. Crewton Ramone's House Of Math® Is a registered trademark.